We’d love your help. Let us know what’s wrong with this preview of Biased by Jennifer L. Eberhardt. We do not have to be racist to be biased. With a perspective that is both scientific, investigative, and also informed by personal exp From one of the world's leading experts on unconscious racial bias, a personal examination of one of the central controversies and culturally powerful issues of our time, and its influence on contemporary race relations and criminal justice. To ask other readers questions about Biased, please sign up. One of the best books about implicit bias I've ever read. It's both personal and data-based, warm and inviting where it needs to be and cold and honest in other parts. I would recommend this to any organization or person or group who wants to understand how bias works and how it's ok--it's not your fault. This is the kind of informative nonfiction that I like to see -- clearly written, incorporating broad statistics and study findings with concrete examples, correlating arguments to current or historical events, and the author's use of personal anecdotes or stories told to her to make the content of her work really connect on a personal level. This is a really well executed book on implicit bias that threads the needle between acknowledging that implicit bias is something that we all inherit & This is the kind of informative nonfiction that I like to see -- clearly written, incorporating broad statistics and study findings with concrete examples, correlating arguments to current or historical events, and the author's use of personal anecdotes or stories told to her to make the content of her work really connect on a personal level. 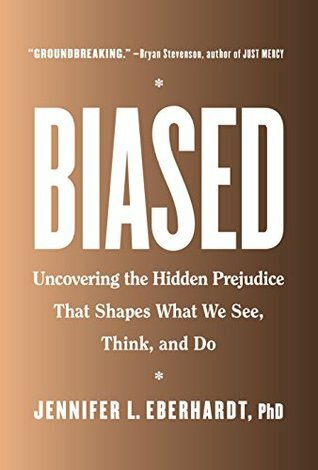 This is a really well executed book on implicit bias that threads the needle between acknowledging that implicit bias is something that we all inherit & are therefore not personally to blame for the problem's origin while still pushing individuals to do their part to change themselves & the world around them. A few of the stories really stuck with me, particularly the arc of her own son's understanding of his own perceptions of black men & how he is increasingly at the receiving end of those perceptions from others as a young black man. "We do not have to be racist to be biased." A relevant, heart breaking, emotionally draining look at the heart of America's racial tensions, social inequality, confirmation bias, racial profiling, and the attitudes that are inherently ours. Social judgements affect both how we see those around us and how we perceive ourselves. Confirmation bias is the mechanism the tool allowing inaccurate beliefs to manifest and persist just as destructive as stereotypes. Racial bias leads to the capacity to do har "We do not have to be racist to be biased." Racial bias leads to the capacity to do harm. It tears away at the very fabric, it pulls the perception of furtive movements . "Just as prison is reserved for those considered too dangerous to walk the streets, the death penalty -the ultimate sentence- is reserved for those deemed too evil too live." "What becomes the external proxy for internal wickedness? My research has shown that the mere physical features of black defendants can tip the scale toward execution." Racial bias is a human problem and one that needs everyone's undivided attention to solve. "Marginalized groups in countries all over the world are often discredited through animal imagery. "For example Black ape association. Increasing rise has come upon dehumanization, in isolation, in societal norms rapidly changing times. In social threats, in school segregation, in bias even during real estate transactions. "Whitening the resume" is something many of color are being forced to utilize. Awareness leads to change and that is the hope for tomorrow and beyond. Thank you to Jennifer L. Eberhardt for this amazing insight as she mentions her own personal trials and tribulations within this insightful read. The partial manuscript available was such a good taste - and even when the full book is ready I have a feeling it will still leave you wanting more. The well researched and experienced examples of our natural bias are indeed groundbreaking; these experiences are not new and revolutionary moments in time - they are mind-bending because they are so familiar and evergreen struggles. Eberhardt brings us to the heart of the issues with a personal voice and detailed understanding of being ripped from The partial manuscript available was such a good taste - and even when the full book is ready I have a feeling it will still leave you wanting more. Eberhardt brings us to the heart of the issues with a personal voice and detailed understanding of being ripped from car from a bias police officer, to rediscovering what freedom means alongside a San Quentin inmate she taught. This is the kind of read we desperately need. The description on the jacket of this book is vague, so I assumed when I picked this up that it was on the more "benign" (no bias is really benign) biases that we experience and participate in in our daily lives, and kind of how to counteract that. 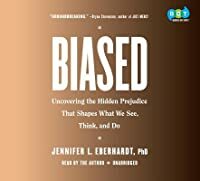 This book certainly talks about the various forms of bias, big to small, but Dr. Eberhardt focuses on the cause and effect of bias instead. She does a wonderful job of using anecdotes to tell stories of how bias affects the lives of those around us while filling those stories with facts and statistics. The amount of research discussed here makes my academic's heart flutter, haha. It's an amazing thing she's done in packing in so much research on such a depressing topic without making the book dull. This is a great social science book... very readable and well written. Audio narrated very well by the author with much passion in her voice. Thanks to San Diego County Library for the digital audio version via Libby app. Biased by Jennifer L. Eberhardt is a free NetGalley ebook that I read in late March. As a reader, I felt a real sense of empathy, heart, and understanding with Eberhardt when she went off-script from her case study findings, training sessions, and airing cam footage. I learned about a myriad of new things, such as the ‘other-race effect'; inner categorization in a similar way to how someone would see apples; training sessions to enable police officers to recognize their own implicit bias when wor Biased by Jennifer L. Eberhardt is a free NetGalley ebook that I read in late March. This is an excellent overview of bias in society, rooted in research and history about the African American experience but occasionally addressing other examples as well, with considerations of many institutions like school, the workplace, and policing and prison, as well as illuminating examples from Silicon Valley. There's also an insightful chapter on 2017's summer of hate and the conflict in Charlottesville. Highly accessible and drawing on fascinating research, this is for a general audienc This is an excellent overview of bias in society, rooted in research and history about the African American experience but occasionally addressing other examples as well, with considerations of many institutions like school, the workplace, and policing and prison, as well as illuminating examples from Silicon Valley. There's also an insightful chapter on 2017's summer of hate and the conflict in Charlottesville. Highly accessible and drawing on fascinating research, this is for a general audience as well as (obviously) human resource departments, managers, educators, social justice activists and business folk. Lest you fear the book may be angry or strident, the tone is actually understanding, insightful, warm and compassionate. Eberhardt is an appealing writer who has clearly made exceptional efforts to craft her book to be clear, approachable, interesting, useful and thought-provoking. Eberhardt makes an excellent case for the power of science to inform efforts to fight bias. A book that will speak to your head, heart, and soul, written by Macarthur Genius Grant winner and Stanford psychology professor Jennifer Eberhardt. I don't think I will ever forget some of the stories she shared. And, despite being a researcher in this field, there are studies she describes which are either new to me or resonating in new ways through her explanations. Professor Eberhardt is a masterful writer and teacher, who somehow walks the tightrope of being both scientific and personal in A book that will speak to your head, heart, and soul, written by Macarthur Genius Grant winner and Stanford psychology professor Jennifer Eberhardt. I don't think I will ever forget some of the stories she shared. And, despite being a researcher in this field, there are studies she describes which are either new to me or resonating in new ways through her explanations. Professor Eberhardt is a masterful writer and teacher, who somehow walks the tightrope of being both scientific and personal in her work. I feel very lucky to have seen an advance galley of this book and highly recommend this book. The title may seem provocative but the book backs up its ideas on bias with numerous studies and lab experiments. We learn that implicit bias (which is a kind of sorting tool in the brain that facilitates how we experience the world) is ingrained in all of us (thanks to evolution). The book examines how a mostly benign implicit bias can mutate into explicit bias, its sinister form, and how this type of bias continues to plague our communities and institutions. Thank you to the author, publisher, The title may seem provocative but the book backs up its ideas on bias with numerous studies and lab experiments. We learn that implicit bias (which is a kind of sorting tool in the brain that facilitates how we experience the world) is ingrained in all of us (thanks to evolution). The book examines how a mostly benign implicit bias can mutate into explicit bias, its sinister form, and how this type of bias continues to plague our communities and institutions. Well researched and also personal book on implicit bias. Mostly racial, but some gender bias also. Mostly in the criminal justice arena, but also in employment, education, and housing too. Worth a read. Informative book that is data driven but interwoven with stories that illustrate the data points. I found it a quick read. This was a deep, thoughtful, and reasoned book. Though I already knew much of what was in it, I learned a lot of new information, too. Powerful information on how bias shapes our world and the chilling impact on our African American citizens. What was missing for me was what I can do to personally check my own biases. Eye-opening information that has deep viewpoints.